Yes! I have some Cake Batter Truffles for you! A little while back, I made some cake batter coconut butter. It was seriously amazing! If you haven’t tried it yet, I highly recommend you do. Then you can use some of it for this truffle recipe. Who doesn’t like cake batter right? Especially when it is covered in chocolate. Chocolate makes everything better! These cake batter truffles did not last long in our house! A decadent truffle made from real food ingredients! Place the cake batter coconut butter in the fridge for 10 minutes to get it a little firm. Using a small cookie scoop , form the butter into balls and place the balls on a lined plate or baking sheet . Once all the balls are formed, place them in the freezer to get firm while you make the chocolate coating. To make the chocolate coating use a double boiler method. Bring a saucepan full of water to a boil. Place a glass bowl on top of the saucepan . Place the chocolate chips and almond milk into the glass bowl . This will gently heat the chocolate so it doesn't burn. Stir constantly until the chocolate is smooth. Once the chocolate is smooth, coat the balls in the chocolate. I like to use 2 forks to roll the balls in the chocolate. Make sure you work quickly because the balls can melt easily. Once all the balls are coated, place them back onto a lined baking sheet. Put the baking sheet into the freezer to get the chocolate to set. Once the chocolate has set, you can store these truffles in the freezer or fridge. Your preference. Enjoy! You are so welcome Carlynn! I hope you enjoy them! 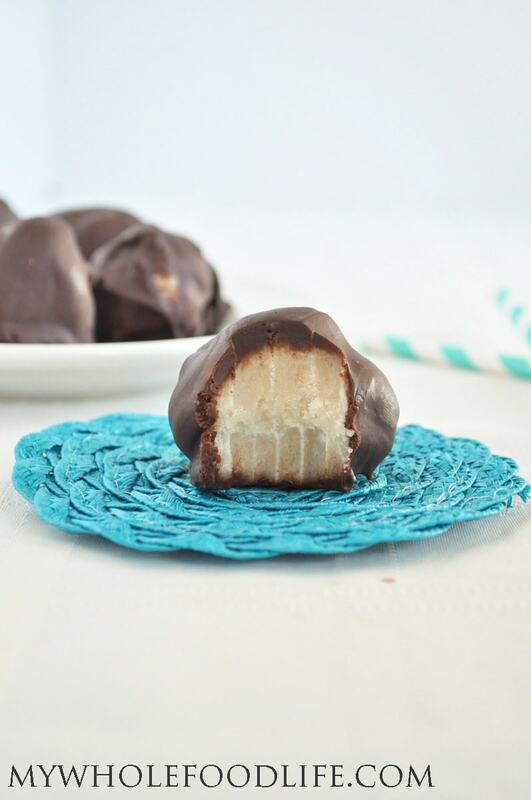 Those look amazing, I have been thinking about making my own coconut butter for a while and considering these delicious looking truffles, I better give it a try! Thanks Lucie! They are sooo yummy! These look great, and mine are in the freezer now! For anyone taking the "shortcut" approach like me, I used a purchased jar of Honey Pecan coconut butter, and this recipe certainly looks like it would be delicious with any flavor! How simple and inspiring! Pinning! I can't wait to try these. They look so simple and I love chocolate dipped treats! Pinned! Will regular coconut butter be ok? Thanks. Yes, but it will taste a little different. Still yummy though!